Kris Janssens is a Belgian reporter based in Phnom Penh, Cambodia. His goal is to tell extraordinary stories about ordinary people throughout Southeast Asia. SIHANOUKVILLE, Cambodia, Sep 19 2018 (IPS) - The new Macau. That’s what the Cambodian coastal city Sihanoukville is called nowadays. Chinese investors are building casinos there on a massive scale. The southern port city lies on the new Silk Road (the so called ‘One Belt, One Road’) and is therefore interesting for China. The Cambodian government is happy to accept the money. And Beijing never asks difficult questions. “Things are happening so fast in Sihanoukville; the city has changed completely in only a few months time,” a friend tells me. My last visit there was in December. And so I wanted to see these ‘spectacular changes’ with my own eyes. My friend was right. When you enter the city, you see casinos everywhere. There could be about a hundred by now, and new ones are constantly being built. Some of them are big showy palaces, but there are also obscure gambling houses. Alongside those casinos you still find the typical Cambodian shops, where people drink tea and where food is skewered and cooked on the barbecue. Tourists at the beach enjoy their cocktails or take a dip in the gulf of Thailand. But all those elements are in disharmony with one another. There is clearly no urban planning here. It seems the builders got carte blanche to satisfy the hunger for gambling. The statue of two golden lions, at a roundabout close to the sea, is a beacon in the city. Leean Saan (76) has a tiny little shop close to the lions. 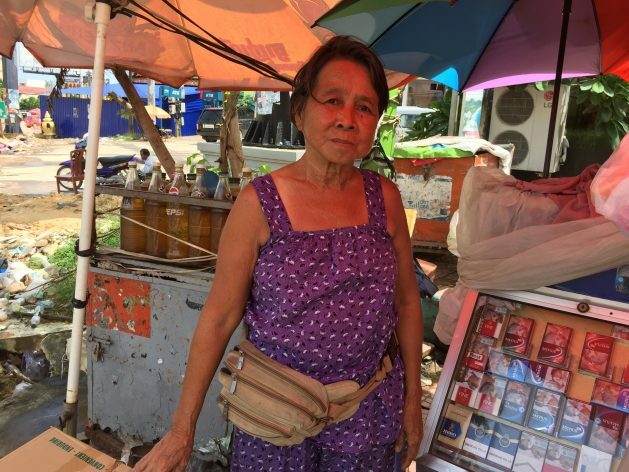 She sells soda water, cigarettes and fuel for motorbikes. I walk down the street and see some Cambodian youngsters who are queuing to buy coffee. They are more positive about the recent developments. It is time to get an inside look into one of those casinos, ‘Golden Sand’. I am the only white person and the security staff watches me closely. At the entrance of the hall the song ‘O Fortuna’ taken from ‘Carmina Burana’ is being played repeatedly. A screen shows an animated movie with Chinese dragons and philosophers. The game room is big but feels cold, in spite of the wall-to-wall carpet and the leather and fabric seats. There are Chinese wall ornaments. Croupiers in red costumes are sitting at big card tables. You see a lot of security agents here as well. Young girls in blue outfits wander down the hall carrying fly swatters to kill annoying insects. Remarkable: Cambodians are not allowed to gamble, by law. So all customers are Chinese. Also remarkable: they don’t come dressed in suits and ties, but are dressed in shorts and t-shirts. Wu is here for six months. He earns 700 dollars a month. He could make as much money in China, but here he has more job security. Srun (28) works as a recruiter. He’s Cambodian but has Chinese roots and works as a tour guide for Chinese tourists. “They often asked me where they could go to gamble.” So Srun went to talk to several casino managers and he has an agreement to work on commission. It is lunchtime. I decide to go for a noodle soup in a…Chinese restaurant. This house owner is actively helping the Chinese settlement in Sihanoukville. His fellow citizens, who might have been born here, have no other option than to leave the city and try to find affordable business premises elsewhere. As long as money talks here, the Chinese population will continue to grow. Maybe I should make the same trip in another six months from now, to document the new changes to this area. *The views expressed in this article are the author’s own and do not necessarily reflect those of IPS.